NOTE: Save a copy of all modified reports! <cd drive>\MiManager\VSReporter\VSRpt7.txt file contains installation and password information. View7Setup.exe will install the Report Designer version 7. "Enable Database Specific Reports if Available". report can be modified. The report is located in the "Report-Edit"
folder under the d:\Program Files\Musick International\Musick Manager. You can either 1) modify the Standard report (path mentioned above) or 2) modify the report and save it to the database. 1) If you modify the standard report, you must be sure to backup the report and restore it after re-install the Property Manager. The standard report will be overwritten by the install. To change the report simply change the report spec (invoice.xml) where the Musick Provider is installed. 2) If you save the new report to the database, the statement will never be overwritten and will be specific to that company. To change a spec that is saved to the database you must do a few additional steps. 1) Start the Musick Manager and connect to the company database. 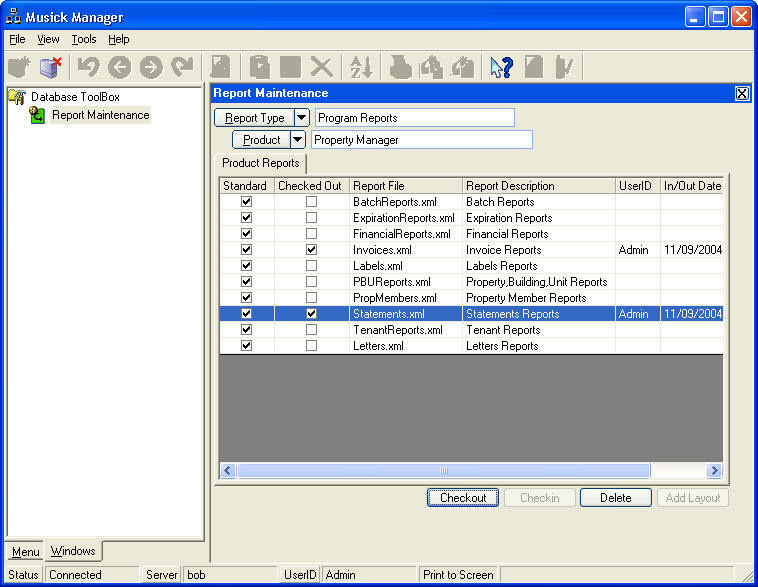 2) From the "Database Toolbox" menu select "Report Maintenance"
3) For the "Report Type" select "Program Reports"
4) For the "Product" select "Property Manager"
5) Highlight the Invoices.xml and Statements.xml and Click the "Check Out" button. 7) Edit the report as necessary. It may be easier to modify the report on the server and then copy it here to save to the database. 8) From the "Report Maintenance" screen highlight the report to save and click the "CheckIn" button. 9) Test the invoice and/or statement that was modified. Thank you for selecting the PROPERTY MANAGER. If we can be of assistance, please contact us at 719-395-4171 or sales@musick-int.com or support@musick-int.com . Thank You for evaluating the PROPERTY MANAGER.